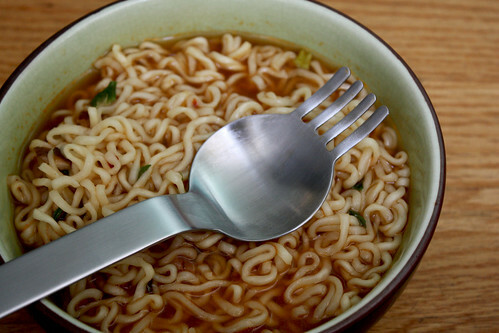 Ladies and gentleman, I present you the Ramen Spoon + Fork (aka ramen spork). This is no ordinary spork my friends. 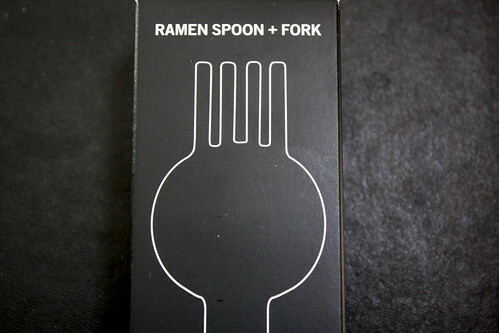 This spork was designed exclusively for the The Museum of Modern Art (MoMA) by Japanese designer Masami Takahashi. My sister-in-law, Hals, recently returned from a trip to New York City, and brought this spork back for me as a souvenir gift. I was totally stoked when I saw it, and thought it was one of the coolest gifts ever. I learned from Wiki that the spork is not a new invention. It dates back to the late 1800's, and because of its versatility, this type of untensil was commonly used by the military and by backpackers. The Takahashi ramen spoon + fork was originally created for use at the popular Sugakiya ramen noodle restaurant chain in Japan to eliminate waste created by disposable chopsticks. It is made of stainless steel, and is also dishwasher safe. 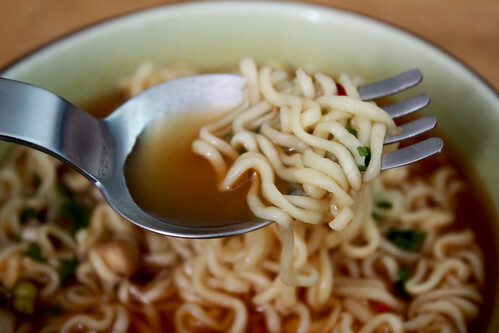 Check out my Ramen Spoon + Fork in action...brace yourself, it's real exciting stuff. The verdict? To my surprise, this utensil worked extremely well. It has changed my view on ramen eating forever :) The spoon part looked a little shallow to me, but in the end, it scooped just enough soup with each bite of noodle. I also really liked the fact that I could fit the entire spork into my mouth without gagging. I've made a commitment to travel with my ramen spork with me at all times in case I spontaneously stop in at a ramen joint...ya never know. Yes, CK is terribly embarrassed by me. Purchase your own Masami Takahashi Ramen Spoon + Fork here. absolutely brilliant. i would buy an entire set of these. I sometimes carry my chopsticks with me. :) But the spork seems like a better idea, good post! Or you can do it like me and bring the bowl to your face so you can shovel everything in as fast as possible.